"He's lying. I already told him that I was a fake member of the spider. That should be enough provocation for him to kill me now..." The aggressor was sure about it. "...but only if he could. My cute bunny and I are starting our romantic date." Hisoka thought and laughed to himself. Though these overwhelming thoughts and feelings were causing him to slightly shiver with pleasure, his mind was fixed on what was going to happen next. He drew the next card from the deck being held by his left hand. "Now what are you going to do?" He really didn't mind what the leader of spiders had told him. "Let's get this over with. No more lies... You've brought enough excitement to me. Ah----" Hisoka almost giggled like Chrollo's fan girl. "I've waited for this day and there's no way that this could be happening!" "There must be something wrong here." "There must be another way!" Hisoka was very disappointed at that moment. Chrollo had no reason to tell a lie and he didn't even try to evade or counter his attack. "Keep calm," he said again to himself. "Killing him here and now would be a waste." All these thoughts went through Hisoka's brilliant mind faster than a bullet. He turned his back and walked away. He wanted to keep Chrollo's presence away from him to avoid himself from committing an expensive act. 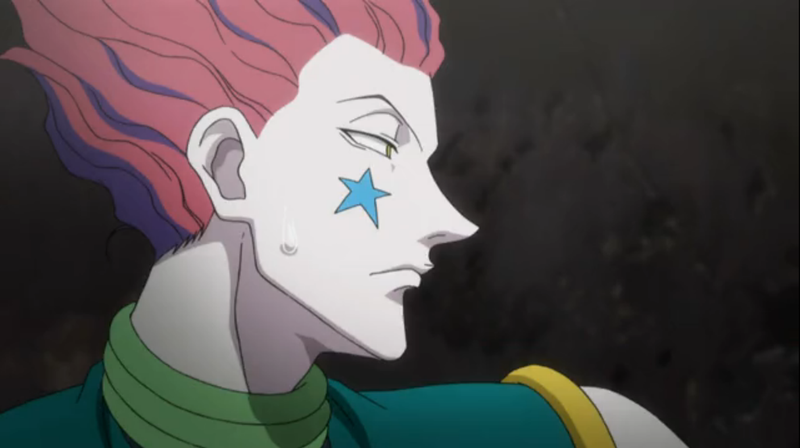 As he was about to flee the scene, Hisoka had heard a very calm voice. "You can now go," Chrollo told him as if his life was not threatened earlier. "I thought it would be a fun date. But it turned sour." Hisoka replied with a scowl. The zeppelin was seen leaving the mountainous area after a few moments. Chrollo was left standing at the edge of a cliff, absorbing everything that happened and trying to formulate a plan in mind. The next days in York New City was scorching hot. 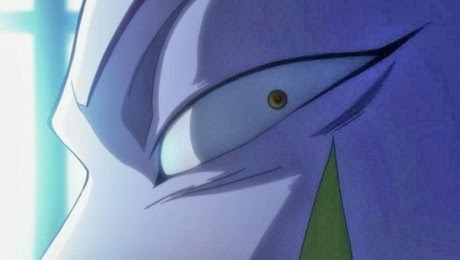 This only fostered Hisoka's lust towards the existence of a worthy opponent. Since he was alone in his motel room, he could not bring out that burning feeling inside of him. He then decided to have a shower before going to his favorite pub. "Shower again," Hisoka complained. "Better to have this than nothing. It saved many lives. Ahhh----." "Too bad my toy was broken. But I think there are still plenty of reasons to cheer up." The undressed clown forcefully removed Chrollo from his weary mind by thinking of fresh faces. "And of course, him," Illumi's expressionless face crossed his mind. But he quickly rejected that thought as he might not be able to afford the Zoldyck's price. His daydreaming was interrupted by a phone ring. He forgot to turn it on silent mode. "Someone remembered me," Hisoka reacted like it was nothing interesting. His mind quickly scanned for a face and name of the possible caller but it really is something that he cannot deduce. He doesn't want to be disturbed but he's got a hunch that it is something of very high importance. The last drops of water were heard from the bathroom. 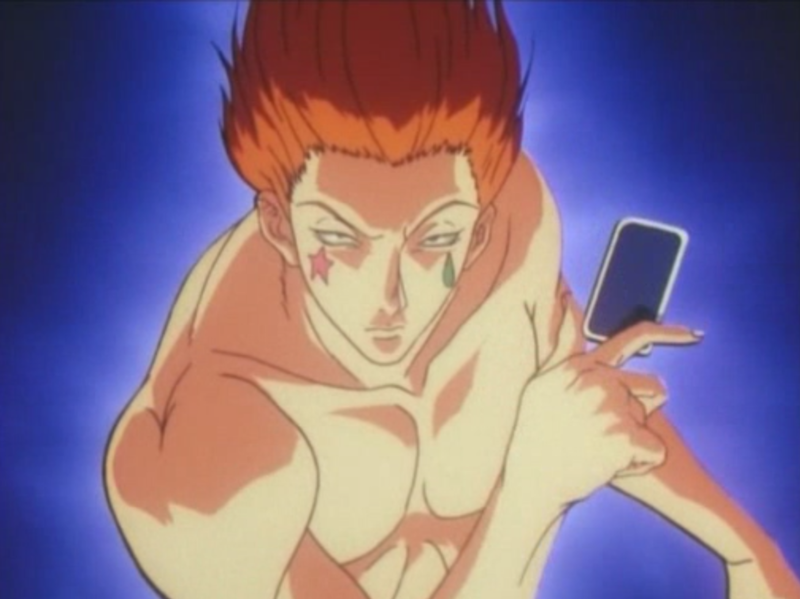 A few seconds later, Hisoka was already standing in the motel bedroom and was about to answer the phone. "Hai," he answered while looking at the front of the bedside mirror. "Hisoka," that familiar voice muddled his calming ritual. "I need you to help me on something. You'll have myself in return." The caller gave him the details of when and where they would rendezvous. 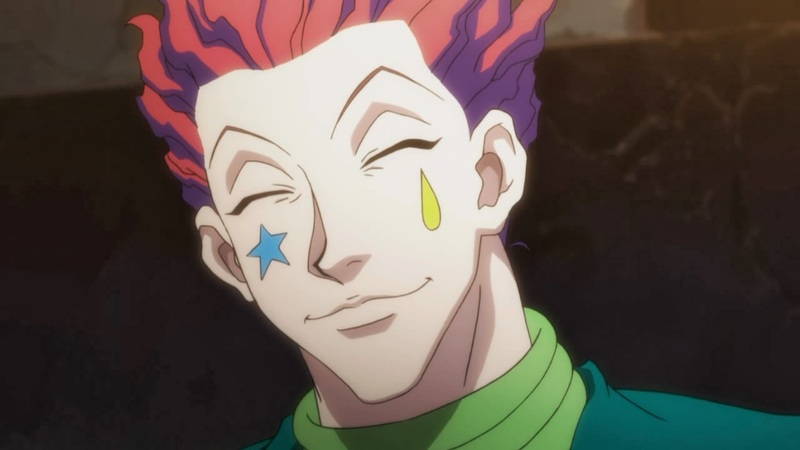 Excited as ever, Hisoka fumbled for something that will keep him pacified for the meantime. Lucy Claire is a small pub in York New City. 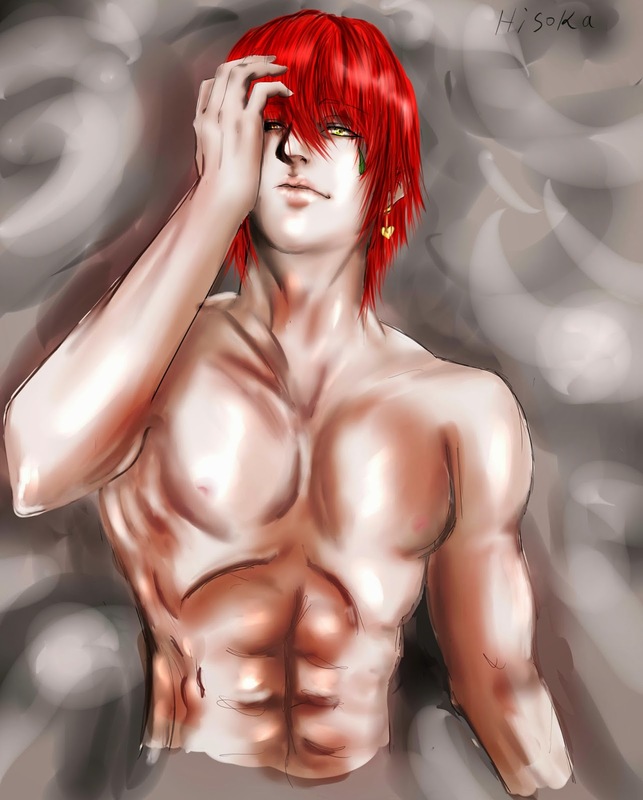 This is where Hisoka spends most of his time to de-stress and keep himself relaxed however, he knew that his day would be different. Escaping the thought of an upcoming date with a person that he really wanted won't be easy. He ordered his favorite drink and settled himself in one corner of the quiet pub. Aside from him, there was another customer sleeping at the bar and the other one was busy amusing himself with two waitresses on the table located at the center. 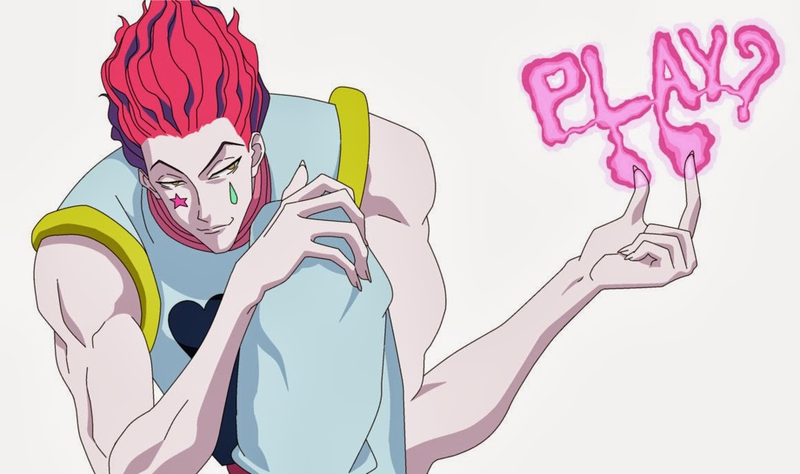 Hisoka was very sure of what he wanted and what he needed. Though there were a lot of prospects, no one could ever replace his current obsession. His mind just went revolving on that man until his imagination was thrown into disarray by a waitress. "Hisoka!!!" A tough looking teenage girl with the name tag "Isabelle" approached and shouted his name. 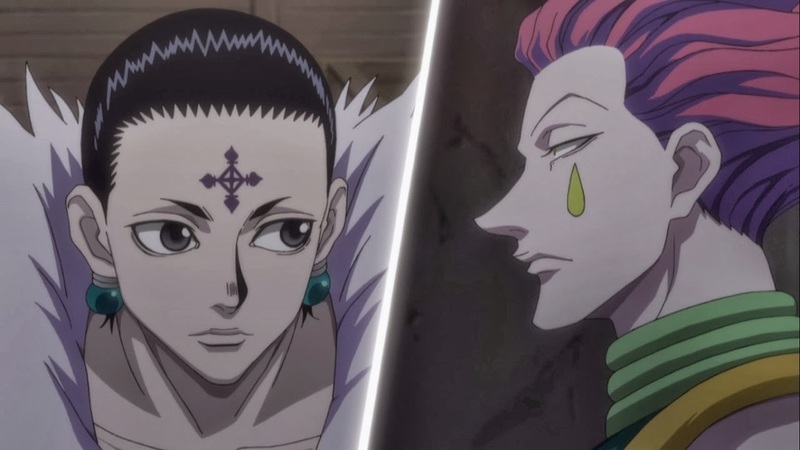 Isabelle's sight were glued to Hisoka's eyes at the moment that they've met each other. Her intimidating presence quickly changed into something that could be easily tamed. "H-Hisoka-san... A-no," she stuttered a bit. As soon as she noticed her sudden awkwardness, she tried her best to regain her composure. "Pay your debt or I'll blow you into pieces!" Of course she won't. Isabelle just needs to scare him a bit so that we would pay. Hisoka was always leaving the pub without paying for anything. He was also the cause of frequent property loss due to some fights that happened inside the pub. He has been doing this for many months of his stay in the city which is why it had accumulated to an amount that could cost him his hunter license, not to mention the interests. His mind was pretty much occupied that there is no time for him to think about money. With this, she totally changed the ambiance of the peaceful pub with this assault. 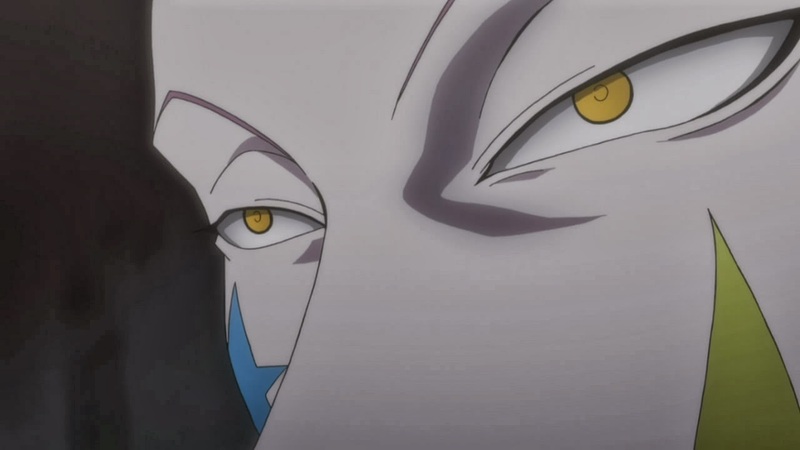 Hisoka's eyes widened upon witnessing the unexpected spike. He didn't anticipate that a girl who looked so pure had the guts to threaten him despite the fact that he killed some customers of the bar in the past. He wasn't sure of what he would do. It is not his nature to hurt a girl or some helpless staffs just because of money issues. What he did next was very surprising. For the first time, Hisoka acted like a normal guy and apologized. He gave the best smile that he could which made him close his eyes and seductively said, "Gomen, Isabelle-chan. I don't have the money to pay you today. Maybe I'll come back tomorrow. That's a promise." Those words filled Isabelle's fan girl heart with ecstasy. Hisoka was next seen leaving the pub unharmed. "Sir, we spotted him. It looks like he is only by himself," a man in black formal suit told someone over the phone. "Be ready to strike. I'll be there at once," replied the voice from the other line. It was a rainy night when a pack of mafia men gathered outside of one of the abandoned facilities in the darkest district of York New City. Armed with guns and launchers, the men in black took their positions and tried to aimed on one spot. A few yards away from the scene was a limousine containing a mafia boss. He was accompanied by two men who dressed differently from the rest of the guards. "These idiots are only for the distraction. Make sure to get the job done." This was the order of a balding fat guy who owned the limousine. A tall guy emerged from the luxurious car. He carried a bamboo stick with him as he took a different direction with the attempt to get inside the building that they are quarrying. Two mafia men followed to assist him on his mission. The other guy that wears a creepy mask and a leather suit joined the mafia gun men. The plan was very simple, yet proven effective. The stronger and more experienced assailant will penetrate through the defenses, while the rest of the forces will ensure that there is no escape for their prey. "Lutz, send us a signal once you've found him. We'll start firing right away," the masked man reminded his partner. "Hai, we're about to climb the building Djorn." Lutz responded. "They're here," a calm voice spoke. "I know, Hisoka replied. He held his phone with his left hand while trying to check what was going on from afar. "I'm still a hundred meters away but I'm sure that I can stop a bullet before it hits you." "I'm not that easy to kill." Chrollo ended the call after he detected the presence of his uninvited guests. He was sitting on the lone couch inside an old spacious room when Lutz and his two men brought the door down. The assailant was not hesitant when he extended the bamboo stick that he was holding. That one-meter bamboo grew longer and bigger after using his aura on it. 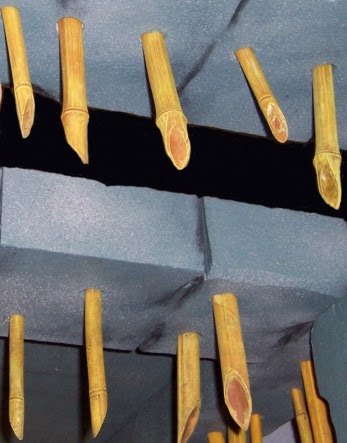 Aside from increasing its size, huge spikes that sprouts more and bigger spikes came out from the bamboo stick. It filled the room and pierced everything inside. Some spikes broke the windows, pierced the concrete and were seen outside. Spikes broke the windows and pierced the concrete. "The signal!" Djorn commanded the battalion afterwards, "Fire!!!" A normal human being would be deafened by hundreds of gunshots. For Chrollo Lucilfer, that sound were only whispers compared to what he have heard before. He was not taken by surprise nor he lost his composure. Even though without nen, the leader of the Phantom Troupe managed to evade the bullets and spikes that appeared all of a sudden, and took out one of Lutz's companion by snapping its neck. He stole the gun from the guy and threw it to the other mafia guard. The man in black was hit by the gun on his forehead knocking him unconscious. Chrollo quickly browsed his surroundings for a possible escape. Before the other guy could take back all of the spikes and change back his weapon to its normal form, the head of the spider was able to escape the infested room. "He is an enhancer." Chrollo was able to conclude the assailant's nen type upon first sight. The hatsu that was performed in front of his eyes only confirmed it. With the target running through a straight corridor, Lutz couldn't help but smile as he thought that it was to his advantage. His sight could reach the end of the hallway which would make it possible for him to wreck the spider with one swoop of his bamboo. Lutz extended his arm and pointed the bamboo towards Chrollo's direction. His aura glinted around him as he started to activate his nen ability. The passage was filled with bamboo and spikes yearning to slice a huge chunk of Chrollo's fresh. A faint smell of blood and bamboo fragrance lurked from the abandoned edifice. "Ceasefire!" Djorn who stood forty meters away from the building had ordered the mafia men like a commandant through radio. "First group, enter the premises." "I think you would need to take a few step closer to the building to check if the target has been annihilated." The mafia boss spoke. "I'll be alright here with the driver." As a nen user, Djorn's physical strength was far from the norm. Aside from this, he could also use En. Walking a bit to the building's direction could help the mafia determine whether Chrollo was already dead. He went outside the car and walked towards the troop. Everything happened so fast. As soon as he had seen the picture of what's happening inside the building through his En, the driver and the boss screamed for their lives. Djorn was able to detect it however, it was too late for him to rescue the mafia head. His instinct led him to go back to the limousine. Little did he know that those were the last steps that he would make. Cards appeared from everywhere finding its way to his body. He was able to evade Hisoka's cards but the bungee gum counter-attacked his physics as everything that was thrown went back to his direction and slashed his head off. "Now Chrollo, where are you?" 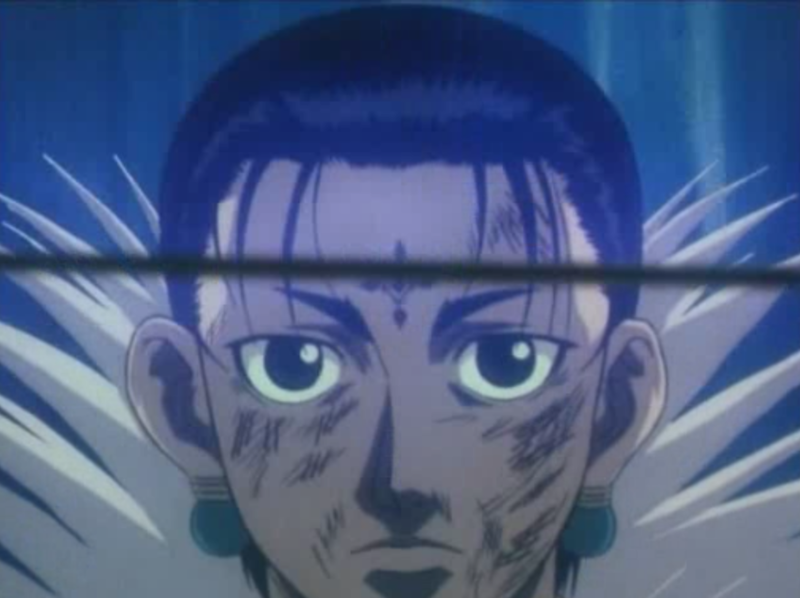 Chrollo was badly wounded because of the strike. He was slightly limping while trying to find a way out of the building. Since the doors were blocked by the huge bamboo spikes, the leader of the Spider was left with no choice but to take a risk. He entered the nearest room which faces the area where the mafia gun men were situated. Every men in black were aiming their firearms to Chrollo's direction. "Just one hint from their men inside and I'm dead." Chrollo was able to predict the possible turn of events. He was thinking of exploiting himself to cause a panic on the mafia's side. "They must be very well aware of how deadly I am," he thought. Suddenly, the door of the room at his back was blasted and it summoned Lutz. He waved his bamboo and Chrollo was pushed back to the window. The gun men saw his silhouette from where they are standing and fired at once. "There is the leader of the Phantom Troupe. Fire!!!" One of the armed men commanded his comrades. He aimed and pulled the trigger. The others did the same. Multiple blasts can be heard from the scene but it didn't seem to hit anything. The mafia men witnessed how the bullets stopped before it reached the room where Chrollo was pressed by Lutz. With stunned faces, they looked at each other just to confirm that it was not just their own hallucination. Everything that they have seen was real. That's how it would appear for people who can't use Nen. But if someone used Gyo, it would be very clear that Hisoka's bungee gum was widely stretched to protect his former leader. He had his sticky and elastic aura attached to a pole nearby before he jumped to a tree standing on the other side so that it would cover Chrollo's location. After a few seconds, some of the guys had noticed Hisoka but they didn't pay much attention to him. "Just finish the job right now. Get the rocket launcher," one of the men instructed. "Hai!" A younger subordinate rushed to the trunk of one of their cars to get the strongest weapon that they could use to break the invisible barrier. That was the only idea that they could think of. Hisoka half-grinned upon seeing what they are about to do. "They are just digging up their own graves." "Here it is. Die spider," big words from an underworld puppy. He didn't know that those were his last. The former member of the Phatom Troupe only waited for the propelled grenade to hit his bungee gum. After it made contact with his aura, he activated its elasticity to make it bounce back to the mafia men. He let go of the stuck bullets as well and showered it back to the pack. 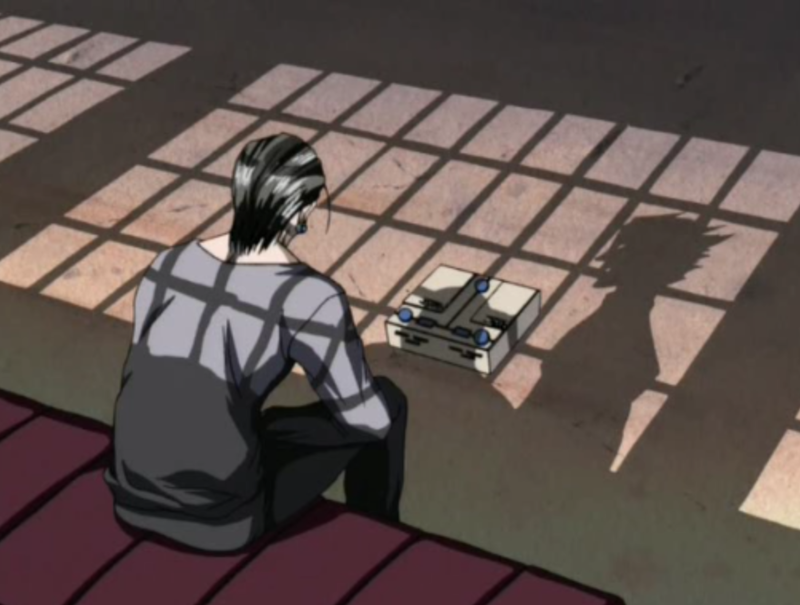 Chrollo was very sure that the ruckus outside was made by Hisoka. He hated the fact that he will be saved by a traitor but he has got no choice. But before he could be saved, there was still something that he needed to worry about. He should find a way to keep himself alive for a minute. "What was that?" Lutz became alarmed however, he was not too skeptical of what is happening. He had also concluded that the head of Genei Ryodan was weaker than he perceived. "Maybe I shouldn't mind it. I'm going to kill this guy right now," the bamboo wielder thought to himself. "You need to give up and go away. It's over. Your boss and the others are all dead." Chrollo decided to buy some time. This is the only thing that he could do as he was injured. He was not even curious if he would die if he broke the Kurta's condition. The rule of nen is always absolute. "Money is not a problem. I kept a bag with a billion jenny on this room. You can take it." The leader of the Genei Ryodan continued to persuade the assassin but it was too late. Lutz's throat was slit by a guy who was standing on his back. An ace of diamond card card was used. "You can finish him off immediately if you have your Nen. He's just an amateur," the killer spoke. "I cut up a bunch of men who tried to climb here as well." "...and like I have said. I can stop a bullet before it hits you," he continued. "Hisoka!" Chrollo didn't expect that he would be able to come in fast. His former member walked towards him while holding up the bloody ace of diamond. He stopped and licked the blood off while looking at Chrollo. "If the boy didn't care about the money, you should be dead by now. 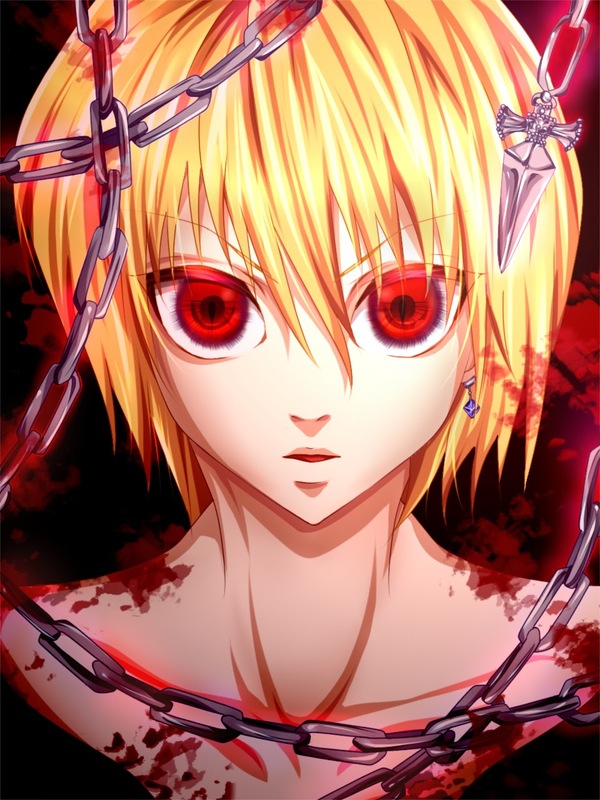 Also, I killed him because I didn't like the way he treated you...." Hisoka's statement seemed to be open-ended. Chrollo waited for his next words. "... my prey." He continued while looking straight to his ex-danchou's eyes. The injured young man of Meteor City stood up as if he didn't hear anything. His shirt was completely a mess so he took it off. He then took a huge bag underneath the table located at the corner of that room. "Follow me." Chrollo was about to walk outside the room when he saw Hisoka staring at him. "Is that the money you are talking about?" Hisoka was curious about it. Though this was weird for Chrollo, he didn't mind it that much. He just ignored the question and went away. Chrollo was already sitting on a couch and wearing a clean shirt when Hisoka came in. He's in front of a gaming console which he managed to stole from the mafia. "Oh, I know that the Greed Island game was expensive but I didn't think that it's worth your life," said Hisoka. "Well it is worth it." The leader of the Spiders explained everything to Hisoka. A spark of hope suddenly enthralled the red-headed guy. He would be able to fight his target after he found the Nen exorcist inside the game. "Oh well... I've got something to do. I'll be back to enter that game," Hisoka said while taking some cash out of the huge bag. Chrollo only watched every move that he made. His temporary bodyguard left a few cash on the table and carried the bag on his shoulders. He was surprised about the act. He never knew that Hisoka would require such money. "I'll be getting a partial payment. Only 10% of my actual fee." Hisoka smiled at Chrollo. "A battle between us would be enough payment for protecting you and getting your Nen exorcist but I really need some money right now." Chrollo had no choice but to let him go with the money. Isabelle had closed the pub as no more customers were coming in. While cleaning outside, she couldn't help but think about their regular customer. That red-headed guy seemed to have captured her heart and he didn't know anything about it. The day had ended without his shadow. It was a very sad night for Isabelle. She felt like she had been cheated on. She really dislike guys who can't keep their words. "He said he will go back to pay." Isabelle spoke to herself. "That was just a lie. He is surely an expert when it comes to that." She really didn't care about the payment. She only would want to know if Hisoka was a man of his word. Isabelle wanted to see him that day but he did not show up. "He broke his promise!" She exclaimed. "Who are you talking about?" Someone asked from behind. Isabelle was in shock. She knew that voice, and the owner of that voice is the one that she was pertaining to. The owner of that voice might have heard everything as well! She turned around and found out that she was correct. It was Hisoka carrying a huge bag and a bouquet of flowers. "He looked... different," Isabelle wondered. "So, who broke his promise, Isabelle-chan?"